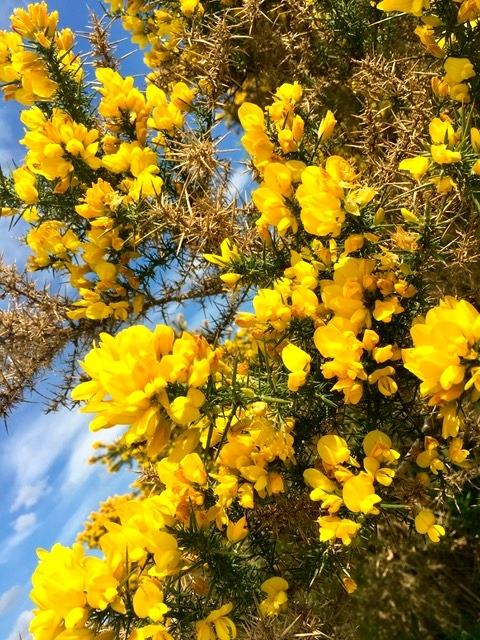 Against all the odds the sun continued to shine today with the temperature reaching 27 degrees. 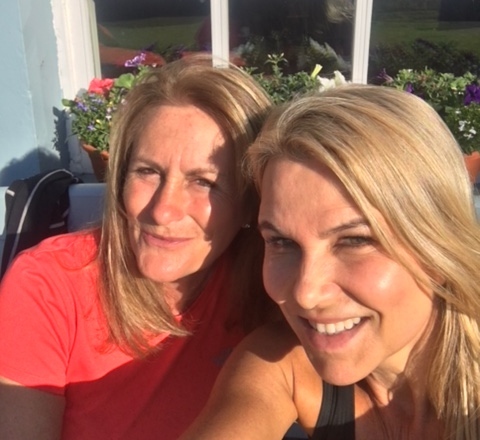 My dear friend Sophie, visiting from Sydney, left a grey and miserable London behind to find The Highlands bathed in sunlight. Who’d have thought it! The Lime Tree had been a delightful stop for my rest day, with all the quirkiness and comfort that an art-loving owner could bring to a hotel. 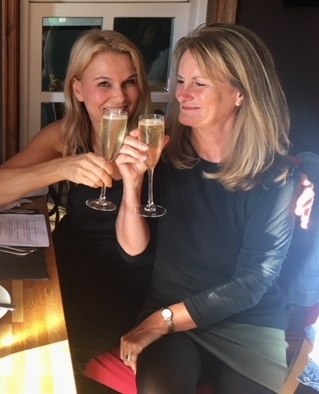 Dinner was delicious last night and we celebrated Sophie’s birthday with a glass or two of fizz, much as I would like to have done with Helks on her birthday last Sunday .. except that the youth hostel was understandably bereft of champagne. Birthday fizz .. sorry Helks! 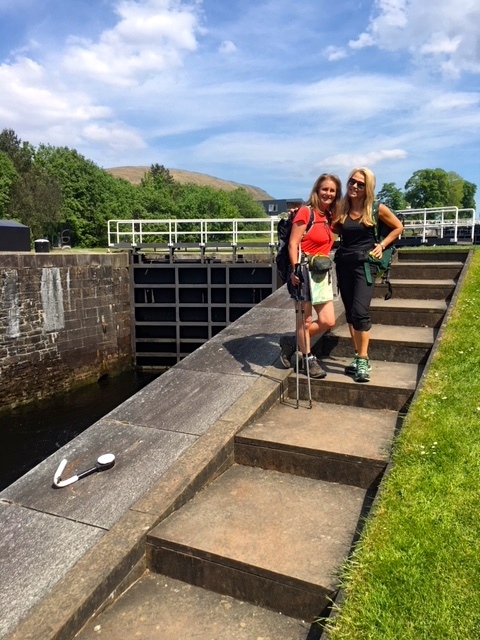 We segwayed on to the Great Glen Way from the West Highland Way this morning and will stay on the trail until we reach Inverness in five days time. 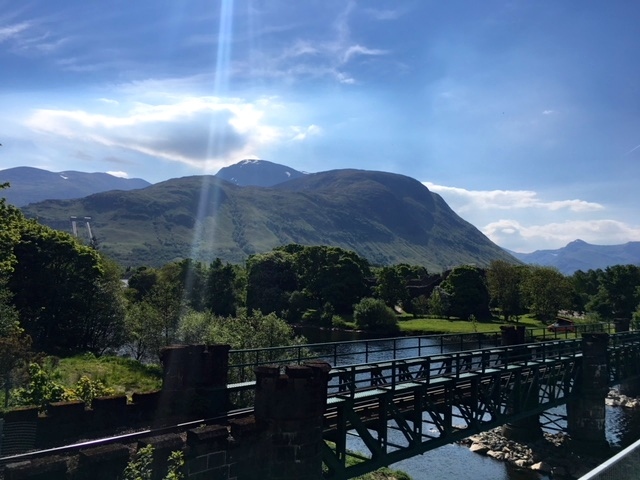 To reach the start of the trail we had to walk through Fort William. We found a couple of charming men there to entertain us. 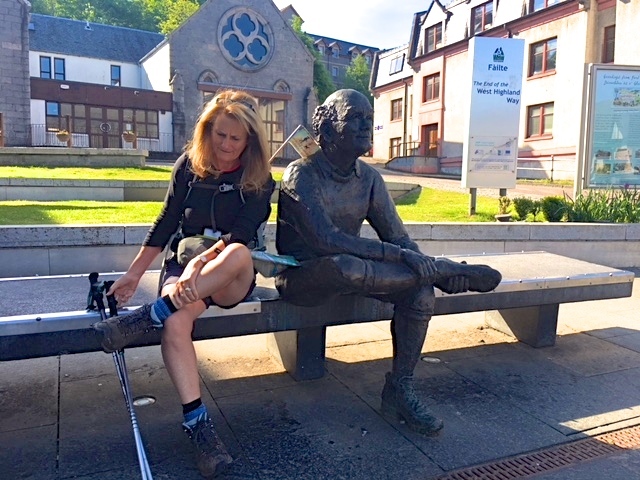 One sculpture marked the end of the West Highland Way and featured a chap rubbing his feet after finishing the trail. It’s aptly called ‘Sore Feet’. 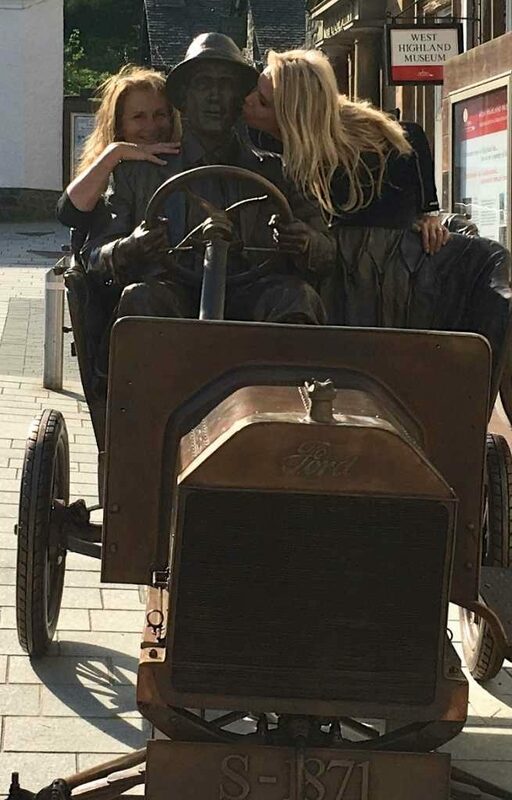 The other was called ‘The Bronze Ford’ and is the full size replica of the Model T Ford car driven to the summit of Ben Nevis by Henry Alexander of Edinburgh in 1911. Extraordinary! ‘Sore Feet’ .. I know how he feels! 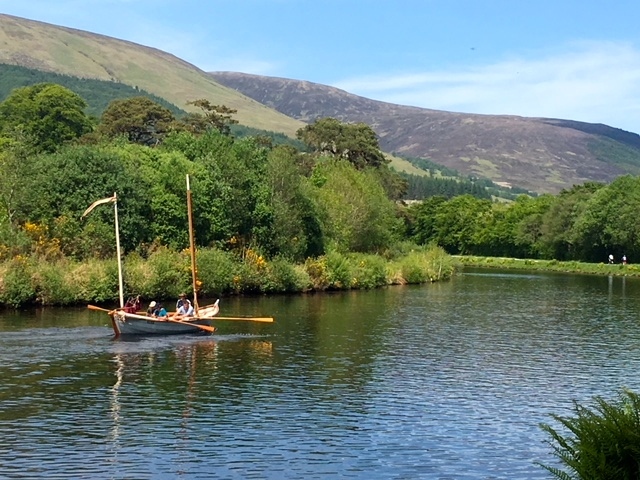 The Great Glen is a remarkable valley, running as straight as a dye along the Great Glen Fault line, from the Atlantic to the Moray Firth. It would be difficult to get lost along this section of my journey. It was a road-maker’s dream in the 18th century, a canal-builder’s dream in the 19th and then a railway-engineer’s in the 20th. 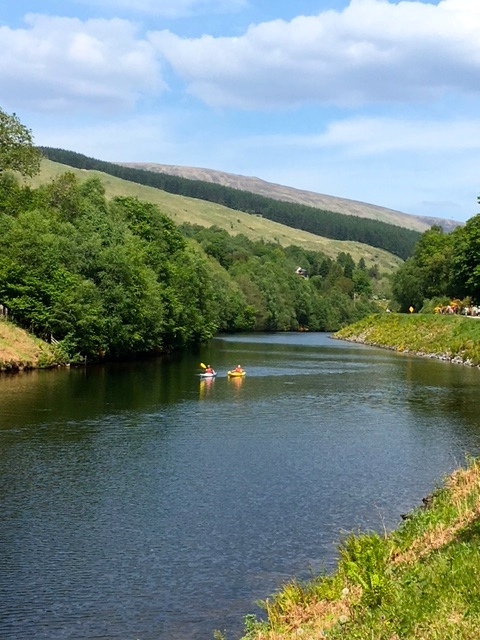 The Canal is called the Caledonian and is notable for being the first government-funded transport project in Britain. 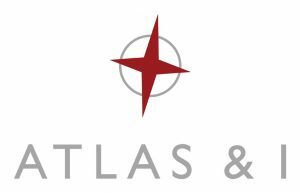 It was a cheap one for the government to pick as only a third needed to be constructed, while the remaining two thirds navigated their own sweet way through the already existing long straight lochs. On our way to join the canal we passed Inverlochy Castle. It’s a ruined 13th century fort and was built by John ‘the Black’ Comyn, Lord of Badenoch and Lochaber and chief of the Clan Comyn. Quite a title by anyone’s standards. It commanded the strategic southern entrance to the Great Glen and was the site of three battles. 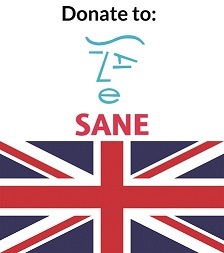 It formed part of a nationwide network of fortifications that helped to secure the Comyns’ as one of the most powerful and upwardly-mobile families of the time. Remarkably, it’s remained largely unchanged since its construction .. although it looks as if it could do with a bit of a face-lift now. 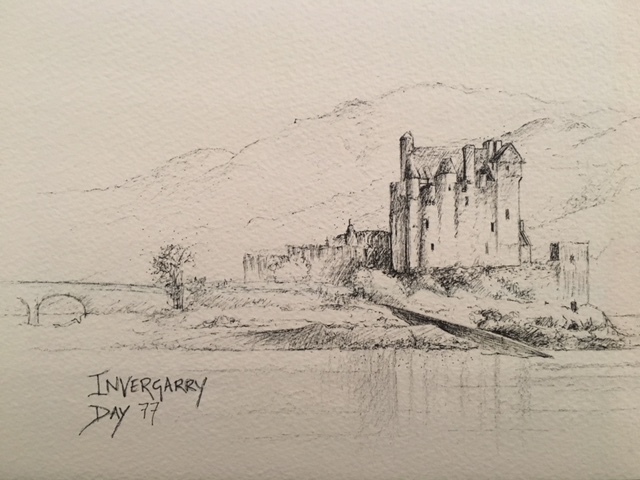 Inver means mouth of the river .. hence Inverness at the head of Loch Ness and here of course, Inverlochy is at the head of Loch Lochy. 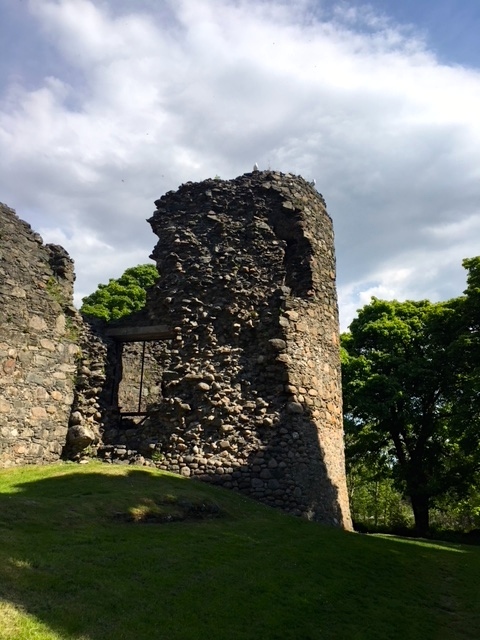 The castle’s sited on the south bank of the river at the strategically important entrance to the Great Glen, a key passage through the Scottish Highlands. With one side defended by the river, the castle’s other three sides were originally protected by a water-filled ditch. Queen Victoria visited the castle in 1873 but complained that ‘there was little left of it to see’. She was not amused. 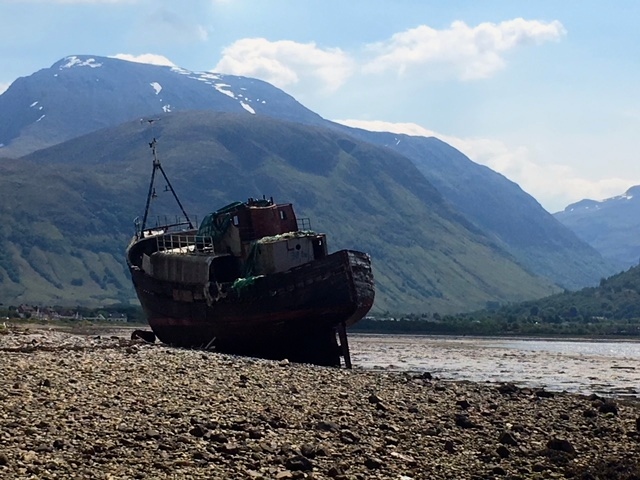 For much of the day we were able to look over our right shoulders and see Ben Nevis, or The Ben as it’s known locally. It looked majestic, with the fingers of snow glittering in the snow. To our left was the estuary, looking like a Cuyp painting with cattle grazing in the shallows. 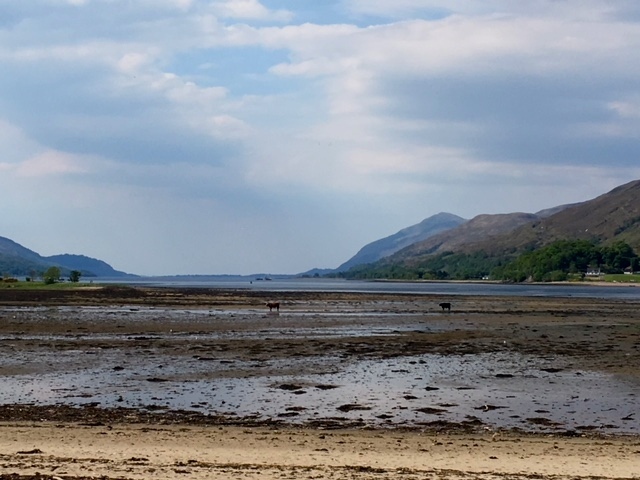 We passed the lochs at Corpach where the Caledonian canal meets Loch Linnhe. It was a pretty little place, milling with Sunday walkers and their dogs and children. There are a couple of other lochs which make up the canal but the really famous one is of course the legendary Loch Ness. But more about monsters in a while, after I’ve told you about shinty. 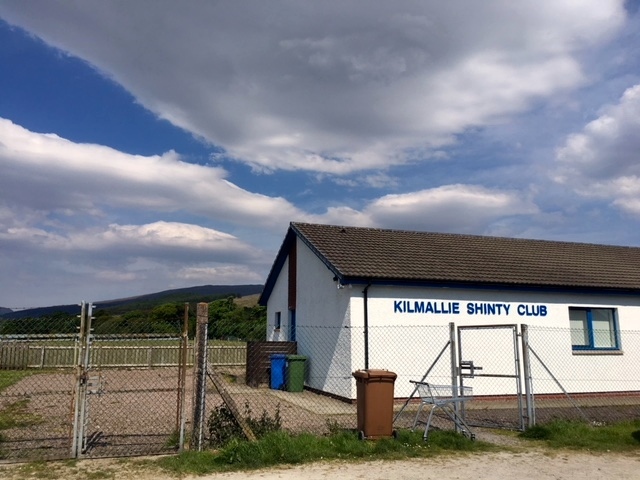 Just after we started out on the day’s walk, we passed by a shinty pitch, still very much in use. 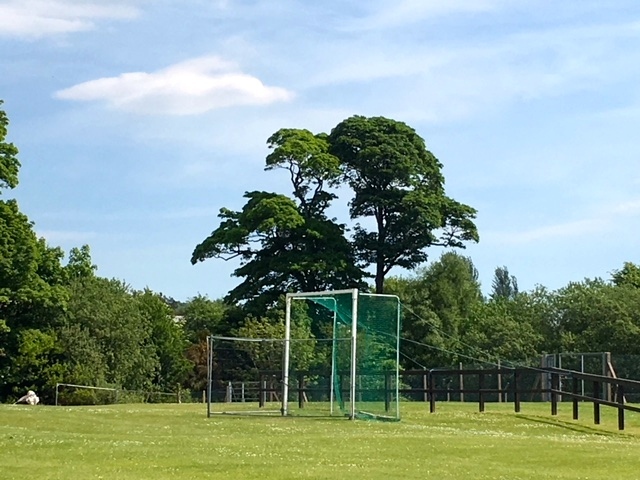 I vaguely remembered Billy Connolly suggesting that Scotland replace soccer with shinty as the national sport after several appalling performances at Celtic Park. But what I found out from Mr Google about the sport completely blew my mind. Shinty predates Christianity. That’s right .. it’s over 2000 years old. There are parallels with hockey .. you play with a stick (a cajan) and a ball but it’s not always a 12 or 10 a side game … oh no! It was traditionally played in winter and on New Year’s Day entire villages would come together to form teams of several hundred on each side. This was more than a team sport! This was a battle! I exhort you to read more about this fascinating sport which has recently caught the imagination of the Californians and a small pocket of sportsmen and women in Russia. Make sure you read the rule about keepy-uppy. After the hairpin bend we came to the charmingly named Neptune’s Staircase. This is Thomas Telford’s masterpiece. With the aid of William Jessop, Telford built the staircase between 1803 and 1822. It comprises 8 locks, making it the longest staircase lock in Britain. It was first hand-powered but has since been converted to hydraulic operation. It takes boats around 90 minutes to pass through the gates, lifting them 20 metres in the process. They’re also much wider than your common or garden lock as they’re designed to take sea-going ships. Hugely impressive. There were dogs aplenty today, all out enjoying the weather with their owners. I adored seeing the black lab carrying a stick .. his owner had a dozen or so other sticks under her arm, all most likely gifts he’d found for her. And then there was the totally gorgeous Parker. Catching everyone’s attention, including two very curious spaniels, Parker was just doing what black lab pups do best .. getting everyone to fall in love with him. And we did. I SO need one back in my life! 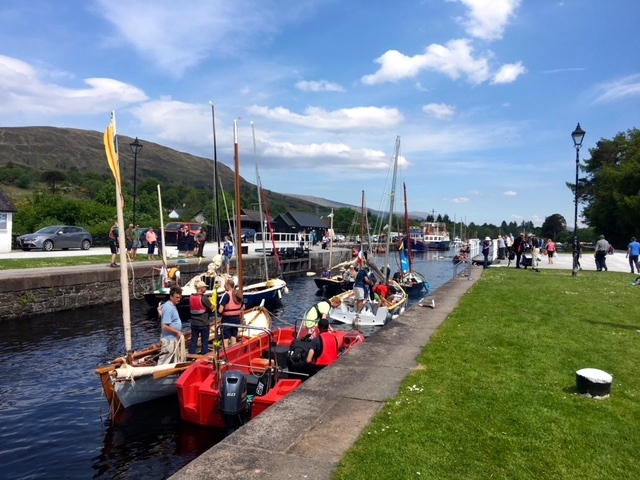 The Caledonian Canal was at its Sunday Best. There were kaykers and rowers, regattas and people fishing, together with cyclists, runners and walkers on the towpath. 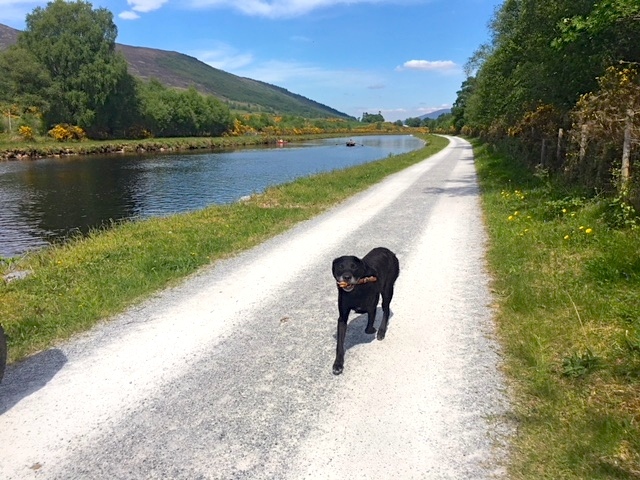 It made for a strong contrast with the Forth and Clyde Canal of a couple of weeks ago, when we saw virtually no traffic whatsoever. 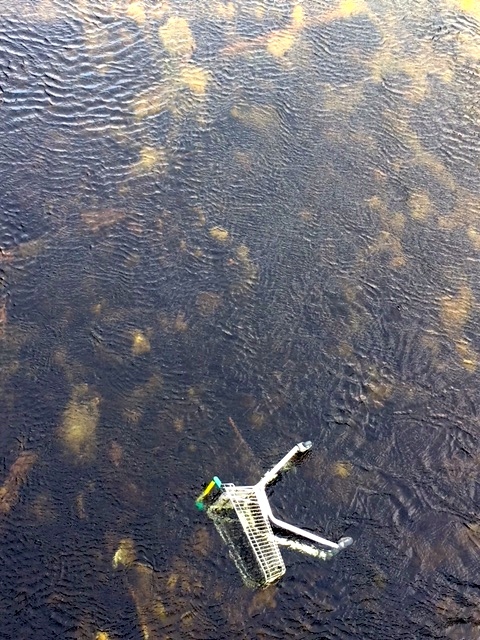 And just in case you thought it was all too idyllic, we spotted the ubiquitous shopping trolley, hurled at one time into the water. 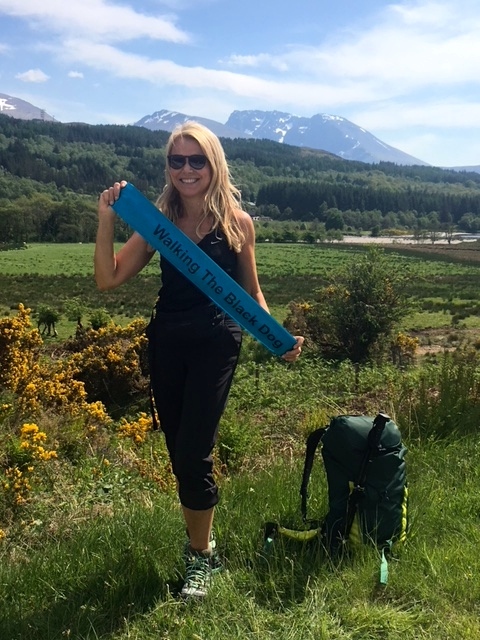 Sophie surprised me at one stage of the afternoon by sweetly pulling out one of the sashes we had used for the fund-raising dinner we held back in Sydney, a couple of weeks before I climbed on my plane to come over and start the walk. It brought back great memories. As we reached the swing-bridge at Gairlochy, there was an information board detailing the unlikely role the area played in World War II. Here, among the quiet hills, more than 25,000 allied commandos were trained between 1942 and 1946. From their base at nearby Achnacarry Castle British Commandos, US Army Rangers and commandos from France, the Netherlands, Norway, Czechoslovakia, Poland and Belgium not only underwent rigorous strengthening exercises, but also enacted full-scale beach assault landings – under fire of live ammunition, in training for D-Day. The commando training marches were utterly gruelling, demanding that troops run seven miles in under 70 minutes and 15 miles in 170, all with heavy packs and wearing the cumbersome kit of the day. I’m pleased if I’m averaging three miles an hour. I would clearly, have failed the commando grade. 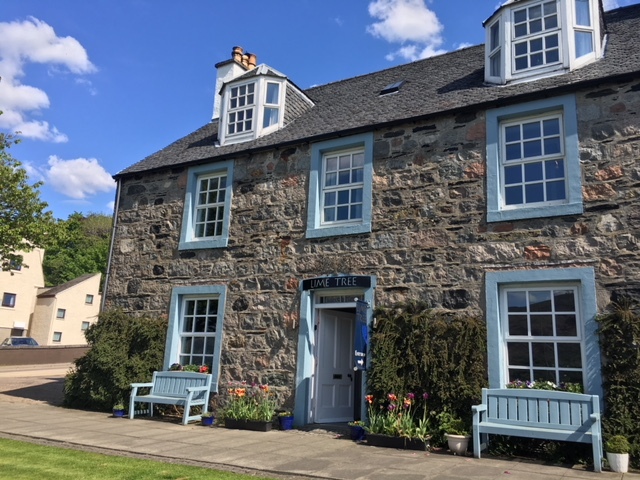 Instead of having to march to our accommodation at the very comfortable Smiddy House in Spean Bridge, Robert the owner picked us up in his car. Don’t worry, he’ll be returning us to the exact same spot tomorrow morning. It was a splendid day, full of warmth from the sun and warmth from our friendship. 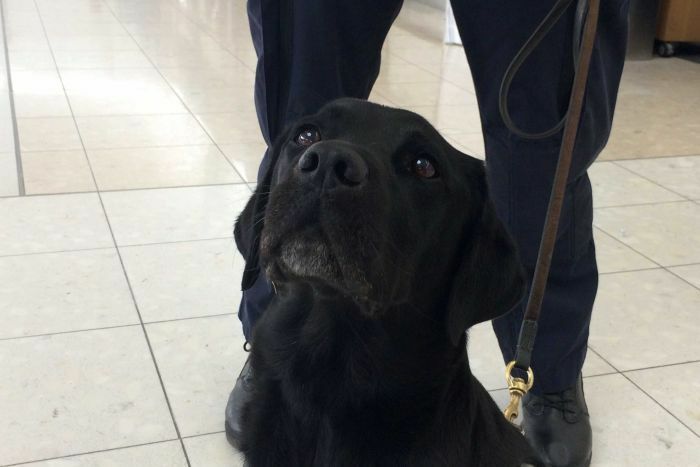 This is the ever-alert Irwin, who works as a detector dog at Adelaide Airport. 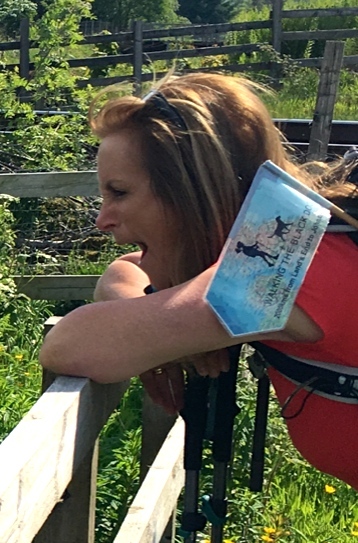 Debby .. great that the blog’s bringing back happy memories, albeit with sunshine. Thanks for your message. I think somebody is going ahead of you and planting all those black labs. Day 77 was my final day – 20 minutes at John ‘o Groats – into the shop to buy a Scottish polo shirt to change into so as not to offend fellow passengers on the bus by wearing the shirt I had used for 77 days – it had been treated to an occasional rinse through. Ha ha!! I’ve so enjoyed all your diary excerpts, Conrad. 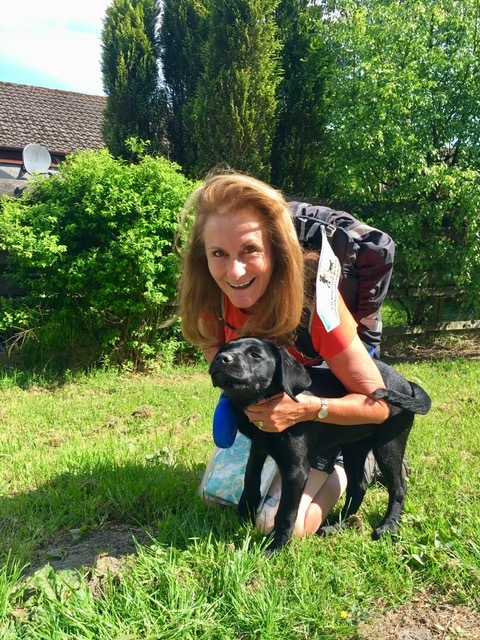 Thank you so much Clare .. you will know from NZ what a great walking partner Sophie is! Hello Jules and Sophie! It was a pleasure to meet you both yesterday! Parker loved his cuddles and attention from you lovely ladies💕 You are doing an amazing job and truly inspirational on bringing mental illness to the fore! Caroline, we both loved meeting you and the adorable Parker! I’m so glad he’s going to be in you and your daughters lives to bring joy and healing. Thank you for taking the time to comment. Means so much. You look wonderful, soaking up the sunshine. So glad you have close friends, and family walking with you along the way. Photos are marvelous. Hope you foot holds up and doesn’t give you too much grief for the final push. 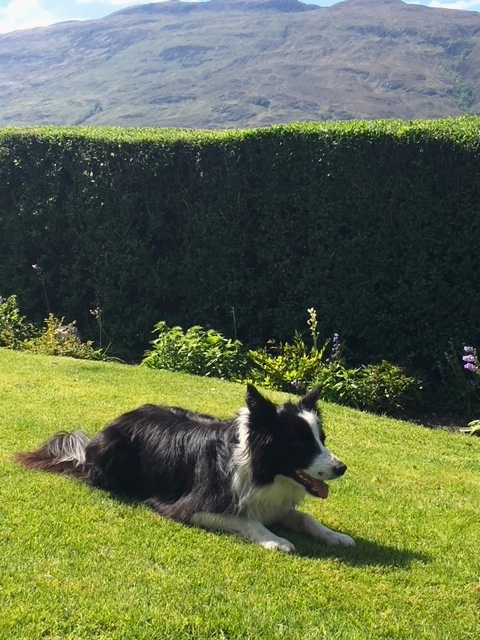 We walked about 5 miles yesterday, and cycled approx 50 miles through some of the small villages around St Andrews, so got to see a bit of the Scottish countryside. Wish I had you with me to identify the flowers and crops, as well as species of sheep we passed. 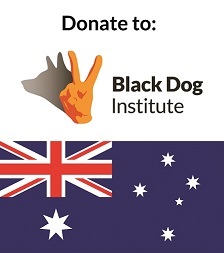 What an incredible achievement, I am sure the Comandos would have been very proud of you, it must take a great deal of courage and determination to organise and execute such an undertaking. The weather looks great for Scotland, just a little different from the start. Extremely proud of you Jules, not too much further now, the photographs are stunning.